Title text: Here, if you know the number of days until the vernal equinox, I can point you to the theater using my pocket Stonehenge. When someone asks me for directions the first thing I assess is whether I should use "turn left" or "turn north" (or whatever direction). Some people handle the former better, and others prefer compass directions. Not sure exactly how I make that assessment ... might have something to do with my perception of how intelligent the questioner is. Compass directions are less ambiguous, so that's how I prefer to give directions. Then again, my wife (a very intelligent person) still gets "left" and "right" mixed up. I hear that's not uncommon. Heimhenge wrote: When someone asks me for directions the first thing I assess is whether I should use "turn left" or "turn north" (or whatever direction). Some people handle the former better, and others prefer compass directions. Not sure exactly how I make that assessment ... might have something to do with my perception of how intelligent the questioner is. Compass directions are less ambiguous, so that's how I prefer to give directions. If I'm driving on a backstreet of a strange town at night I prefer TURN LEFT to TURN NORTH. I'll bet she writes with her right hand. I can see ambidextrous people getting confused. Considering that roads around here usually don't go in the direction they say they do (ie "west" on a certain highway might in fact be more north or south), and that I don't have a compass unless I wanted to rely on my cell phone (in which case I would be using GPS anyway), compass directions are pretty much useless as long as roads are involved. Heimhenge wrote: When someone asks me for directions the first thing I assess is whether I should use "turn left" or "turn north" (or whatever direction). Add a third option to the cardinal directions and relative directions debate: directions by large geographic landmarks, e.g. "toward the mountains" / "toward the ocean". That's very handy around here, where people might not be clear if inland is east or north but they can always just look up and see the mountains and go toward those, or away from them if they're trying to turn "toward the ocean". The sun rises and sets in the same place in Australia as it does in the US, but goes north instead of south. 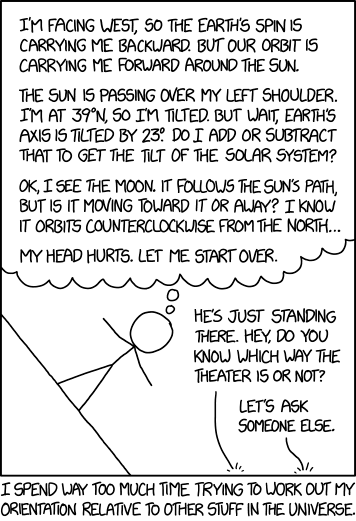 I've spent enough time trying to solidify my intuition for how things move relative to all the other things that move that I felt unavoidably compelled to point out that, if he is facing west, the earth should be carrying him backwards around the Sun (seeing as how the Sun moves east through the zodiac ie the earth orbits the sun counterclockwise viewed from the north)... or did I get it wrong? or was the strip deliberately wrong? No, not really a matter of where I am. I guess it's just a hangover from my Boy Scout days (BGPS) when we had to learn navigation with a compass and map. Me, I prefer to get directions based on cardinal directions probably for the same reason. huenthar wrote: I've spent enough time trying to solidify my intuition for how things move relative to all the other things that move that I felt unavoidably compelled to point out that, if he is facing west, the earth should be carrying him backwards around the Sun (seeing as how the Sun moves east through the zodiac ie the earth orbits the sun counterclockwise viewed from the north)... or did I get it wrong? or was the strip deliberately wrong? No, it's correct. Looking down at the Earth from above the north pole, east is the counterclockwise direction and west is clockwise. Therefore, if you're facing in the clockwise direction and the Earth is spinning counterclockwise, it's moving you backwards. During the day, he's standing on the inside of the Earth's orbit, so in that case, looking clockwise on the curve of the earth translates to looking counterclockwise on the sun's orbit. During the night, however, looking clockwise on the earth translates to looking clockwise relative to the sun. Therefore, we can surmise that it is daytime when the events in the comic occur. Now the tilt of the Earth is either added or subtracted from your latitude depending on the season, and the time of day also matters. Wish I could find it, but there's an old Peanuts strip that shows Charlie Brown lying on the ground looking at the sky, doing a version of this xkcd about how the earth is turning on its axis, and flying along its orbit, and being carried along by the rotation of the galaxy. The last panel ends with him saying "Sometimes when I lie really still, I can feel it all happening." ...but not silly enough to prevent its existence! JohnBurger wrote: There's a brilliant SF book by Gertrude Friedberg, "The Revolving Boy" (1966). A delightful book! Read it many years ago and never figured on encountering it again, it being kind of obscure. But where else but on xkcd. keldor wrote: During the day, he's standing on the inside of the Earth's orbit. I knew I must have been overlooking something important... Thanks! There's one set of directions I give from time to time, which goes something like "Starting from [landmark], head east, go past [minor landmark] and keep going, up the spiral staircase, over the rooftops, across the motorway, past [minor landmark] to the south and turn north at the lights. It's just past the [shop] on your right." Yes, here. Mensa member and often confusing left and right. Or at least I really have to think hard. Cardinal directions make much more sense. If something is north of you it is always north of you, but what's left and right depends on where you're facing. I remember visiting southeast US and I was so delighted that highway signs said "north", "south" etc. That is much more helpful when driving around a country than the name of some city you only roughly know where it is, or maybe even don't know at all. sotanaht wrote: Considering that roads around here usually don't go in the direction they say they do (ie "west" on a certain highway might in fact be more north or south), and that I don't have a compass unless I wanted to rely on my cell phone (in which case I would be using GPS anyway), compass directions are pretty much useless as long as roads are involved. Why do you need a compass? Sun's position and time of day is enough to give you a rough idea where the main directions are. rhhardin wrote: The sun rises and sets in the same place in Australia as it does in the US, but goes north instead of south. Yes, that always takes a bit getting used to when on the southern hemisphere. I also found it funny how around the equator you don't take much notice of the sun during daytime, because it's so high above you. Today's post reminded me of something I've wondered about before: is there any way for us to know exactly how fast we're actually going, in some sort of absolute terms? The idea came from a friend of mine and I joking about a time machine, how even a few seconds forward or backwards in time would invariably leave you in space because Earth spins, goes around the Sun, which moves relative to other stars in the area, all of which are moving in our galaxy, which is moving, etc. etc. etc. It got me wondering if there was any possible way to correct for that, even hypothetically. Any ideas here? herbstschweigen wrote: I remember visiting southeast US and I was so delighted that highway signs said "north", "south" etc. That is much more helpful when driving around a country than the name of some city you only roughly know where it is, or maybe even don't know at all. OK, I've complained about this before, but imagine you're on the London Underground (map), at Notting Hill Gate, and you want to take the yellow (Circle) line to Victoria. What direction will denote the correct platform on the signs? Sure, but that map is geographically nonsense anyway. DJ JD wrote: Today's post reminded me of something I've wondered about before: is there any way for us to know exactly how fast we're actually going, in some sort of absolute terms? The idea came from a friend of mine and I joking about a time machine, how even a few seconds forward or backwards in time would invariably leave you in space because Earth spins, goes around the Sun, which moves relative to other stars in the area, all of which are moving in our galaxy, which is moving, etc. etc. etc. It got me wondering if there was any possible way to correct for that, even hypothetically. Any ideas here? No. Speed is just a measurement of how fast you are moving away/from a declared point. If you have no reference frame, you can’t measure velocity. DJ JD wrote: is there any way for us to know exactly how fast we're actually going, in some sort of absolute terms? No, because there's no such thing as "absolute" position. It's not like the universe is a grid. There's nothing there, literally, except other moving parts. There's a whole thread on this, but it's rather high pressure. Maybe, but topologically it's perfect. My point is that, if you're using that kind of map, you need to identify lines and directions in a way that's consistent with the schematic nature of the map. Having "eastbound/westbound" at a station where the line is shown as a platonic vertical is just stupid. Perhaps the easiest solution would be to give the name of the next station served by each platform ("Circle Line via High Street Kensington". They do this sometimes, but the "via" station is often quite far away and ambiguous). But I'd personally prefer the Circle Line platforms to be "clockwise" and "anticlockwise". rmsgrey wrote: There's one set of directions I give from time to time, which goes something like "Starting from [landmark], head east, go past [minor landmark] and keep going, up the spiral staircase, over the rooftops, across the motorway, past [minor landmark] to the south and turn north at the lights. It's just past the [shop] on your right." And those who don't think that helices are spirals. ...and on the lingering theme of Namespace Land Rush, pocketstonehenge.com was grabbed back in 2006. Archive.org shows that it's always been a parked domain name. Someone is paying the 18-cent ICANN fee annually to hold on to the silly name. Same thing here where I live (Philadelphia suburbs); many of the roads go in a NE-SW or NW-SE directions. If you're giving driving directions to someone often the only value a compass cardinal direction has is when the road sign actually says North/South/East/West, but just because the road is labeled in one direction doesn't mean you're always going in that direction. In fact, a major interstate (I-95) essentially makes a very wide U-turn over many miles; such that you can drive on I-95 "North" and it slowly turns east and then almost due South where the road changes names to I-295 South. It's very confusing to people unfamiliar with the area. Also throughout the Appalachian Mountains you'll find most roads strongly influenced by terrain and topography, typically running NE-SW in direction of the mountain ridges and valleys, or NW-SE in the direction of gaps cross-cutting the ridges. left/right people set it so the map rotates, so the top is the way they're facing. n/s/e/w people set it so the map doesn't rotate, and the top is always "north". Road directions are often helpful, though. Even if they don’t run in exactly that direction, if you’re going a long way on a road, it’ll usually put you more or less just direction from where you started. I don't think I could get on with rotating maps (caveated in the last paragraph). Does the text on the map (vector-rendered, or rasterized but upon independent rotational origin points) rotate to always stay screen-upright, likely ruining various map-design paradigms of not overstriking their neighbouring labels, or are they nailed solidly to the rotating substrate? Or, like road-number labels on most maps, are they inclined upon the road with 'up' being the diagonal direction that has a positive screen-up value? I think I'm mostly a magnetic/axial-orientator, thinking about it. My hand-held and internally imagined maps tend to be north-to-top (where known). That said, if I can see a landmark ahead of me, atop a hilltop across various wild/rural folds of landscqpe or intervening urbanised environment, I might not bother too much to establish the exact north-south axis while taking tracks, roads or open cross-country 'green paths' towards my destination, avoiding such impermiable land-boundaries as properties, un-styled/gated field walls, ribbons/expanses of water or verticalities (up or down) of geology. If I already have the mental map I think I maintain a duality or superposition of upright/experiencial orientation. If I have a physical map, it takes priority whilstsoever the briskness, breeziness or precipitative nature of the air (or the available illumination) allows its constant deployment. Gloved hands, gales, driving rain and moonless darkness sets me onto the memorised fall-back, that is. A car GPS display (which I don't have, have experienced in other people's vehicles and note that facinatingly distract me as a passenger such that I see far too little of the outside view) does twist and turn (with tilted obliquety, to match thr proposed forward view) and they've obviously worked a lot on that, but the pirouetting labels and icons have to be necessarily much sparser than a fixed-to-substrate map. Maybe still practical, but not as much fun for a true cartophile. herbstschweigen wrote: Yes, here. Mensa member and often confusing left and right. Or at least I really have to think hard. Cardinal directions make much more sense. If something is north of you it is always north of you, but what's left and right depends on where you're facing. Well, I am convinced I screw up left and right because I am a lefty and the world is broken. But is this really true? If you move 20 miles north then a thing that was 10 miles north is now 10 miles south. And do most of you live in a place where the roads allow you to keep these things straight? I drive a stretch where a road changes from 440 South to 287 North, all while traveling more-or-less east-to-west. And why doesn't everybody just give coordinates and let Google figure it out? Who leaves the house without a phone these days? Soupspoon wrote: A car GPS display (which I don't have, have experienced in other people's vehicles and note that facinatingly distract me as a passenger such that I see far too little of the outside view) does twist and turn (with tilted obliquety, to match thr proposed forward view) and they've obviously worked a lot on that, but the pirouetting labels and icons have to be necessarily much sparser than a fixed-to-substrate map. Maybe still practical, but not as much fun for a true cartophile. First, No True Cartophile, but secondly, I think you're really over-thinking this "pirouetting labels" thing. They all move together. Therefore there is no collision. They can have the same labels. AND I would think it would be MORE fun because it's not as wrote and monotonous. I use a non-rotating map, because the landscape gets unfamiliar when I rotate it and I lose my sense of where things are, but I’m often translating to left/right in my head to understand how to turn. exoren22 wrote: I think you're really over-thinking this "pirouetting labels" thing. They all move together. Therefore there is no collision. They can have the same labels. Imagine you're driving on a road from Scarborough, North Yorkshire, to Holyhead, Anglesey. For some reason, you have two particular places marked on your display. Sutton-Under-Whitestonecliff is just ahead of you, while Llanfairpwllgwyngyllgogerychwyrndrobwllllantysiliogogogoch is nearly at your destination. The map orients to your direction of travel (which, off the top of my head, I'd say was just a tad south of westward, if you want the verisimilitude) and your display has both places marked on it with horizontal-to-display text labelling, one safely above the other. Then you do a U-turn, just (you forgot your Welsh dictionary!) and the display turns the map round. To get one name 'past' the other without collision is going to be awkward. Obviously, this is contrived. And one name may disappear off the bottom before the rotation (when it hoves into view as the other slides round the other way on an arc of its own) but any information-rich density of texts, and even off-round symbology, within a given quarter-arc that remains on the screen as you follow a twisty-turny route is going to start interfering in ways that the initial renderer ("what are the most important labels, and do I have space and the right zoom to add these next ones, without over-remdering?") must dynamically decide whether to re-render the text-objects continuously to avoid non-colliding items colliding after a twist to the POV puts them in close contention. Either that, or just miss out so much detail that each text-label 'reserves' a full circular space on the screen, so that it never threatens to collide in the first place, disqualifying many a useful marker that could display, closer in but above or below, but is nixed 'just in case'. i've read somewhere that it's a gender thing. apparently, statistically, males prefer to hold their map north-up, while females tend to orient the map to coincide with their viewing direction. Same thing here where I live (Philadelphia suburbs); many of the roads go in a NE-SW or NW-SE directions. [...] just because the road is labeled in one direction doesn't mean you're always going in that direction. In fact, a major interstate (I-95) essentially makes a very wide U-turn over many miles; such that you can drive on I-95 "North" and it slowly turns east and then almost due South where the road changes names to I-295 South. It's very confusing to people unfamiliar with the area. You beat me to it. It's even more confusing from the other end, i.e. you're going south through New Jersey (probably on I-95, just to be all, like, crystal-clear and stuff), and then you exit onto US 1, go quite a few miles west(ish)... and then you get to an intersection that essentially says, go north here to get on I-95 south. Which, as we established, is now about 20 miles behind you, because in addition to that U-turn, there are actually two completely different roads, which never meet, that are called I-95. I'm one of those who never learned "left" and "right" - I mean, I know which side is which, I just don't know which word goes with which side. Growing up in Southern California, I was pretty good about west=north vs. south=east, just based on "the ocean's that-a-way"... and then I moved to the opposite coast. It still feels wrong to be facing north and having the ocean on the right. speising wrote: i've read somewhere that it's a gender thing. apparently, statistically, males prefer to hold their map north-up, while females tend to orient the map to coincide with their viewing direction. Not surprising, since there's a measurable difference in spatial intelligence between the sexes. Being better at spatial visualization means you can deal with a more abstract map (one that's rotated relative to yourself) more easily. "The theater is three blocks makai." "But we're in Nebraska!" "Uh... If you get to the sea, you've gone too far."